In developing its new series of single-disc machines, Kärcher placed great emphasis on ensuring that they are ergonomic and labour-saving to use. The machines were therefore equipped with two robust steering bars that give them great stability and make it possible to fit an extra-wide handle. This makes all five models in the series very smooth running. The brush deck can be folded upright for transportation and stowage. This saves space and makes it easy to move a machine to the work site. Each of the five models currently available has its special area of application. The BDS 33/180 C Adv has a working width of 330 mm and is ideal for cleaning small and medium-sized areas. The BDS 43/180 C Adv and BDS 51/180 C Adv models have a considerably greater working width and twice the motor power (1,400 W). 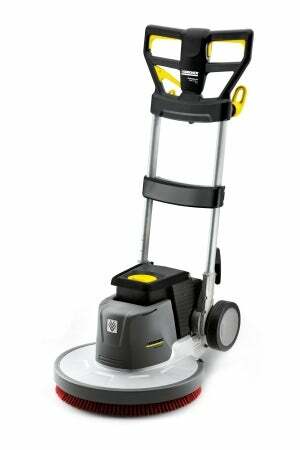 This gives them sufficient capacity to clean large areas and remove stubborn dirt. The BDS 43/450 C Adv has a brush rotation speed of 450 rpm for polishing and spray cleaning. The BDS 43/Duo C Adv combination model can be operated at either 150 or 300 rpm, which makes it possible to clean and polish with a single machine. Even novices can quickly learn how to operate these single-disc machines. All elements required for cleaning are coloured yellow. All models have a motor with planetary gears in which power is transmitted via metal cogs. This makes it very hard wearing and, compared with a belt drive, virtually maintenance-free. For sanding wooden floors or polishing, models with a 430 mm working width can be fitted with a suction ring and vacuum unit that instantly picks up the dust generated. An optional 10-litre fresh water tank (8-litre in the BDS 33/180 C Adv) is mounted on the brush deck. This gives the machine a low centre of gravity and ensures a good balance, so the operator uses less energy when working. The water feed is controlled via a lever on the machine handle. The tank is removable and has a carrying handle and a water-level indicator to make it easy to fill. The new single-disc machines can be stowed safely in a very compact space. The brush deck can simply be folded up into a vertical position. An automatic locking device prevents it from flopping down again unexpectedly. The water tank fits between the two steering bars and cannot leak even when the machine is in the parking position. A 10-metre extension lead is supplied as standard. For practical reasons the permanent power cable is only 50 cm long. If the cable is run over and damaged accidentally, it is easy to replace without the need to repair the machine. Bayonet-type connections enable disc brushes and pads to be changed easily without tools. After work, they and the power cable can be hung on hooks on the machine.